Sue Steggles was a pupil at John Scurr primary school, Bethnal Green in the East End of London in the 1960s. After attending grammar school, she trained to be a nursery nurse. Subsequently, she retrained as a primary school teacher and taught at Curwen primary school in Plaistow, Essex, Old Ford Primary in Bow, London and now teaches at Sheringham Primary in the London Borough of Newham. Sue has moved away from classroom teaching and currently leads an intervention programme for reading and writing (Reading Recovery) in the school as well has having management responsibilities. I went to school in the ’60s so it was a long time ago. I remember being in a very safe environment where we all gathered around the teacher as she imparted her knowledge to us. Her name was Miss Bird and she made learning fun and interactive. I remember she had a big desk and we quite often stood around that while she demonstrated the task. There were no soft areas to sit in, linoleum floor and ply chairs and tables. The space seemed large, but that may have been because I was about six. Was there a place in the school that you particularly liked? It was always a safe and comfortable space, and here I mean the whole school. I used to like going to the office, where you were often sent when you had completed a good piece of work. There was a secretary and a carpeted area and soft chairs to sit in while you waited to see the head. I hated the playground. Because I have always been larger than the other children, I never had many friends and the playground was rather rough. Children like me often just sat on a bench waiting for it to end. Did your primary school have book corners and if so, were they well-designed and used? I cannot remember a book corner. When you trained to be a teacher, did you have any specific training in how to set up a classroom? I trained over five years so I had a good selection of classroom experiences across London. I also did some volunteer work in school so I was able to see what worked well. I wasn’t shown how to set up a classroom specifically but saw many orientations for desks, chairs, carpet space etc. I was also extremely lucky in my first school as the nursery leader at the time set up my classroom for me and decorated the walls with amazing friezes. Therefore the book corner was set up for me in a truly inspirational way, which has helped me develop this practice across the age groups I have taught. I was also assisted in setting up my first role play area, so I knew what to do and what the outcomes could be. When you first started teaching, how did you feel about your first classroom? It was ready for me when I arrived and I was eternally grateful for this. I felt scared. I didn’t feel as if I knew what I was doing. As a specialist reading and writing teacher, how important is the place where you teach for the success of the reader? I don’t particularly like the room I teach in. However the space can be secondary to the teaching in this instance. I think this is because the child has one-to-one time with an adult entirely focussed on them. For most children this is what they need to enable them to achieve. Your current primary school was completely redesigned in 2012 . Did you have any input into the qualities you wanted in the building? I came into the school as the work was being completed so had no input at all on anything. I was part of the teaching staff in a school that had a complete rebuild before I came to this school. However class teachers were not asked anything about the design to that school. 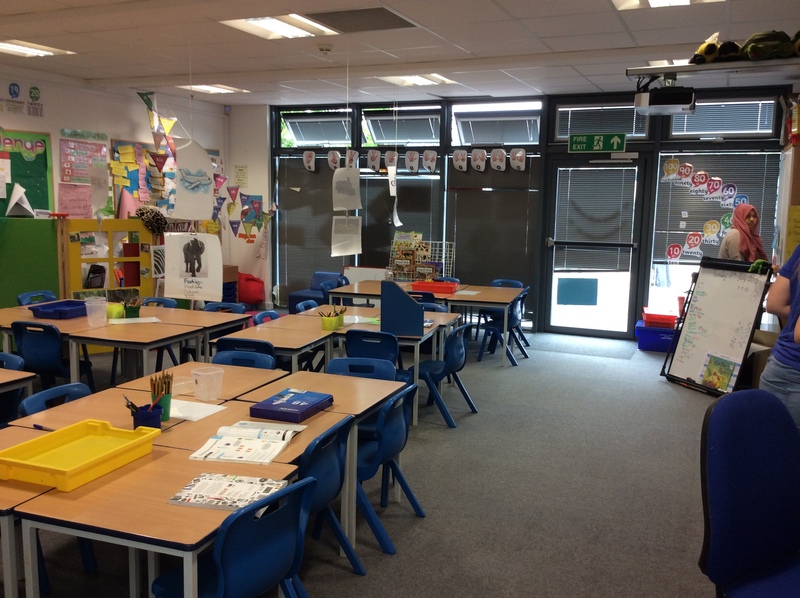 You’re the training manager for new teachers in your school – what do you tell them about design of their classrooms? I give a general walk around the school and a chat to new trainees as part of their induction but do not specifically draw their attention to the design or facts about the school. If you could change one thing about schools in the UK, what would it be? OFSTED and school league tables. If you had an hour to spend with an architect, what would you talk about? Air conditioning! The heating in this school is not right for individual teachers and classes of children. What’s the best reading place you’ve ever been in or seen? A couple of years ago a newly qualified teacher (NQT) set up her reading corner with home cushions, bean bags and soft furnishings. She then added a full length curtain from the ceiling so the children had privacy. To watch the children in that secure little area was amazing.